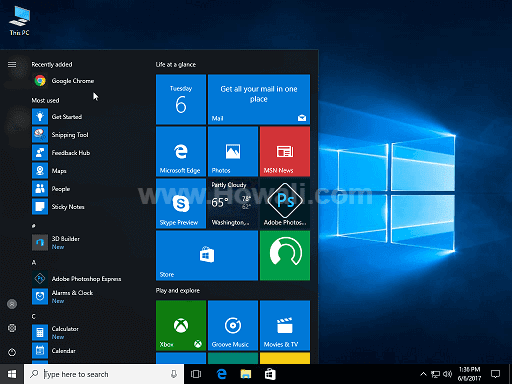 Microsoft has launched Windows 10 officially with Professional, Enterprise, Education and Home editions. Day by day changes are coming in the operating system and new releases are launched. Upgrading to Windows 10 has become a necessity considering new updates. But before you can actually upgrade your system, you can try to install Windows 10 on Virtual machine software such as VMware Workstation. It’s so easy to install Windows 10 in VMware workstation that even a beginner can do that through this simple guide. 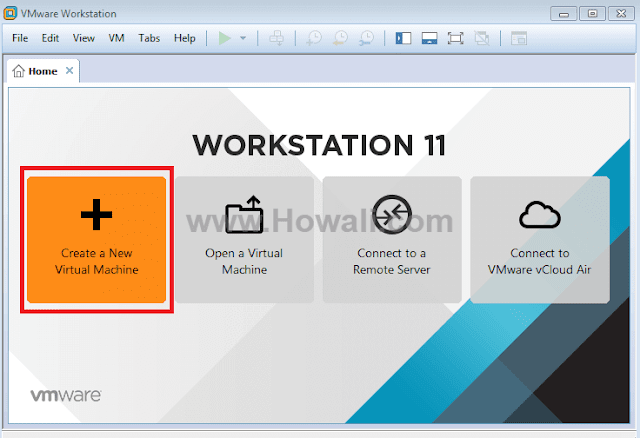 Today I will show you how to install Windows 10 in VMware Workstation 11. But before that let me tell you that this post is going to get updated in future based on latest technological updates. So don’t forget to subscribe to my email list and bookmark this post for future reference. If you are using Vista, XP or Windows 7 or 8, then you can try to install Windows 10 on your pc using VMware workstation. So let's proceed with the installation. 1. VMware Workstation 11 - You can download VMware workstation from the official website. You can either buy it or download a trial version. 2. 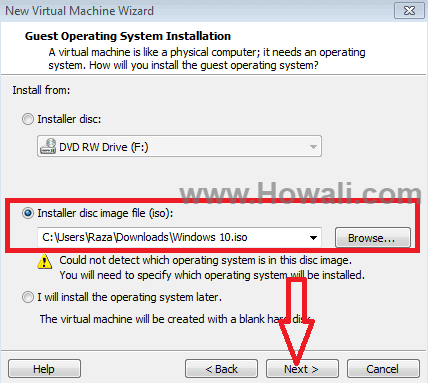 Windows 10 (ISO File or DVD) - You can either download an ISO file or use a DVD. 3. 4 GB of RAM - You will need minimum 4 GB of RAM on your system. But 8 GB is recommended. 4. Dual Core CPU - Minimum dual core is required, but Quad core is recommended. 5. Sata Hard Disk - Hard Disk space of minimum 60 GB is recommended. 1. Launch VMware Workstation from Desktop or Start Menu. 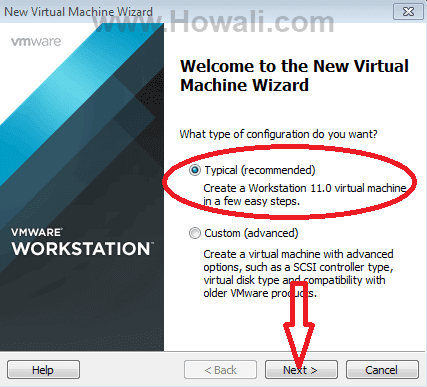 Once VMware Workstation is launched select, "Create a New Virtual Machine" as shown in below in the image. 2. Now you have to select the configuration type. If you are an advanced user and you have knowledge about SCSI controller type, virtual disk type, etc, then you can go with Custom (advanced) option. I will show you the Typical (recommended) method. Select Typical (recommended) as shown below in the image and click Next. 3. Now you have to locate and browse Windows 10 ISO path in which ever folder your ISO file is there. Normally VMware detects the ISO file automatically. But in case if it doesn't detect, so you have to browse through your folder and locate the path manually. If you don't have ISO file or DVD then you can download it from the link I have mentioned above. Refer below screenshot. Once you have located the ISO path, click Next. 4. Then next step is to select a guest operating system. 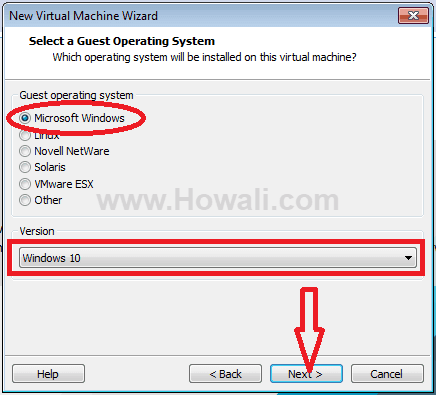 In the Guest operating system you have to select Microsoft Windows and in the Version you have to select Windows 10 as shown below in the image and click Next. 5. Then you have to Name the Virtual Machine. I have mentioned Windows 10 as my Virtual machine name. You can change the location of your Virtual Machine where your files will be stored. I have gone with the default options and click Next. 6. Next step is to Specify Disk Capacity. I would recommend you to keep it at least 60 GB. 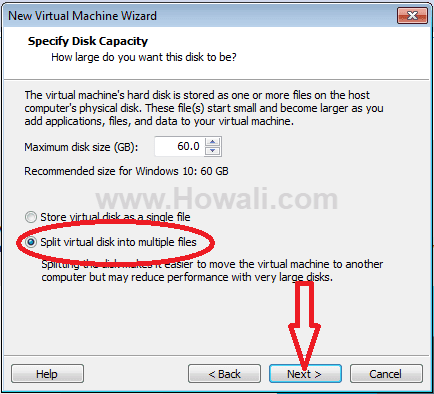 Then choose Split virtual disk into multiple files option as shown below in the image because "splitting the disk makes it easier to move virtual machines to other computer". Then finally click Next as shown above. You will get another Customize Hardware... option. If you don't want to customize your hardware then you can go with the default settings and click Finish. 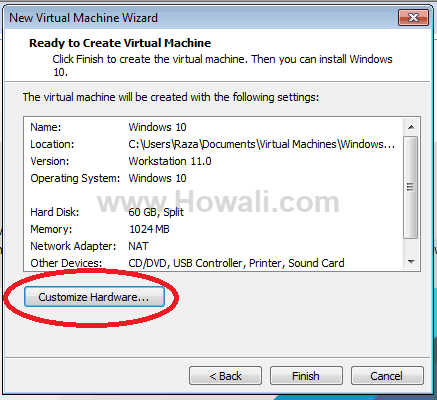 But if you want to customize the hardware, then don't click Finish and follow Step 2 to customize the Hardware of your Virtual Machine. 1. Click on Customize Hardware... as shown below in the image. 2. Select Memory option on the left pane of the Hardware window. 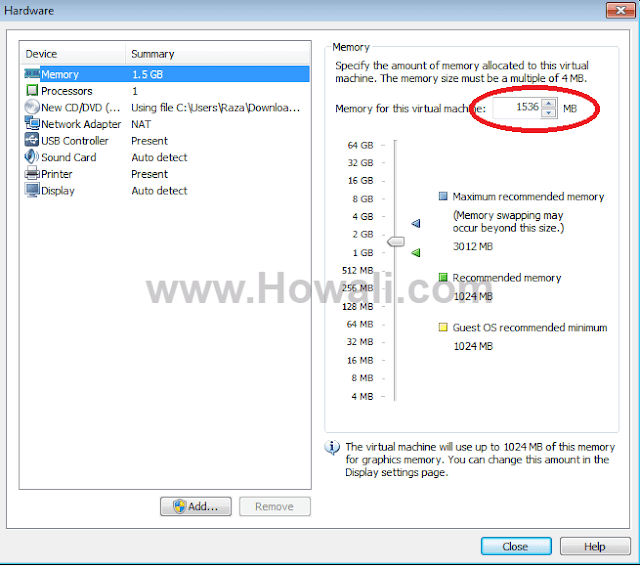 Change Memory for this virtual machine. I have less RAM due to which I have gone for 1536 MB (that is 1.5 GB) of RAM. But if you have more RAM then you can increase it as per your pc configuration. 3. 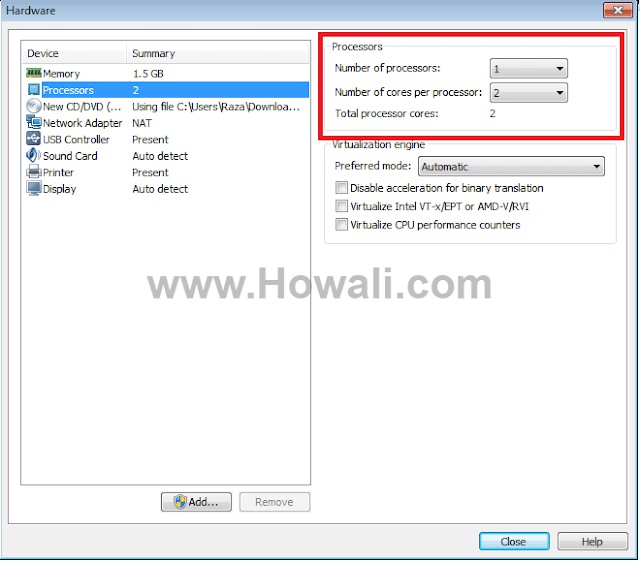 Select Processor option on the left pane as shown below in the image and on the right pane you change number of processors and number of cores per processor as per your pc configurations. Once you are done with customization of Memory and Processors, finally click the Close button on the bottom of the window. 4. 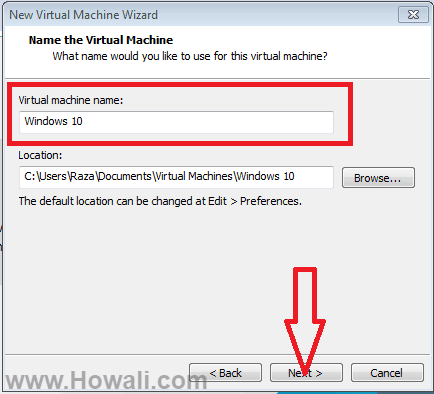 Now you can click Finish on the New Virtual Machine Wizard as shown below. 1. Launch VMware Workstation and click Power on this virtual machine as shown below. 2. The installation will begin in few seconds. Just follow the on screen instructions and you are done with the installation. 3. 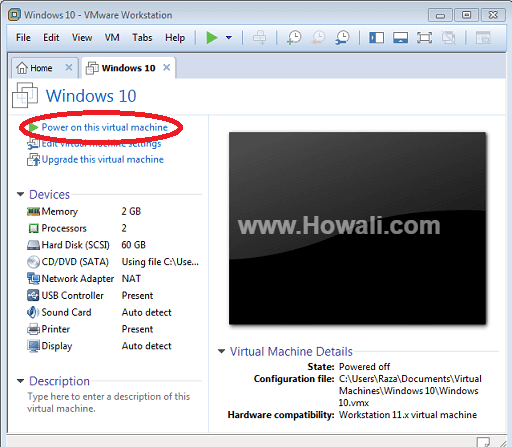 Enjoy Windows 10 Virtual machine on VMware workstation. Do let me know through comments how this post has helped you and don't forget to subscribe to my email list from the top left of the screen. If you like this article then do give me a +1 and a Facebook like. You can also share this article with your friends from the social network buttons below.